Its some time since PERFECT SHOW has been going on and I have been fortunate in having your support and whole hearted response to the PERFECT SHOW (PS). There have been some who have told me that they have found the "PS" very inspiring and have learnt something from the PS Guest's life. That was my major purpose, when the idea of PERFECT SHOW came to me. To learn from others and empower our life so that we live our life to the fullest.,. And so we come to the main heroes of the SHOW, our GUEST. Iam indebted to all the guest , Past, Present, Future Guest who have/has/will be in the show, for sharing their learnings with everyone. With all humbleness, here is a tribute to them. 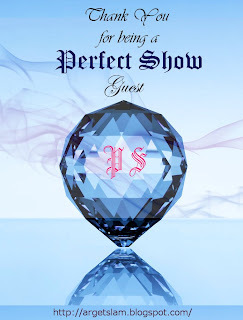 I present this blog jewel to all my guest for being a guest in the PERFECT SHOW. This blog jewel was designed by my junior Arvind Jayashankar, who is pursuing his III year Mech Engg in NITT. I thank him devoting his time and efforts for designing the blog jewel. P.S: if you have been wondering what does PPF in the Title stands for, i would say you have got an inquisitive mind. Anyhow, I would love to hear from you what do you think it stands for. I will post the abbreviated form after checking out what others might have understood it as.